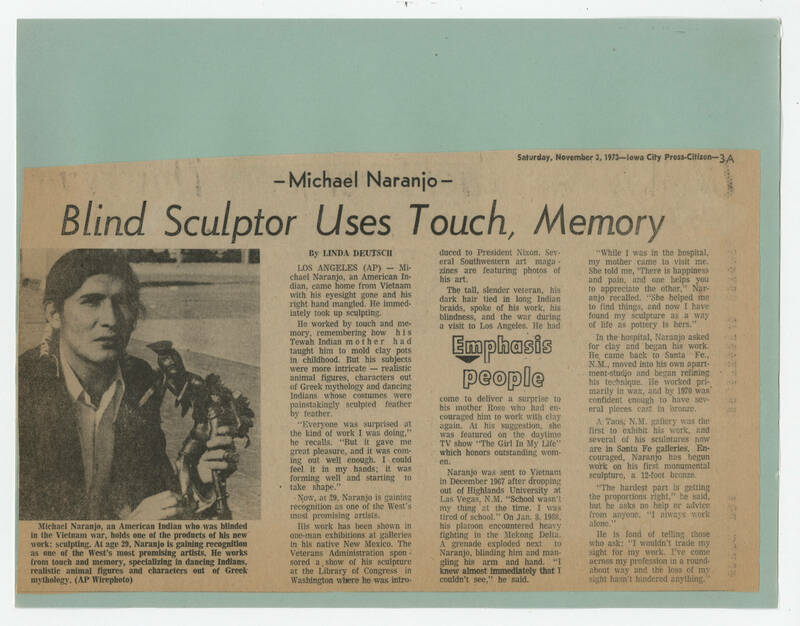 [[Top right of clipping]] Saturday, November 3, 1973 -- Iowa City Press-Citizen--3A [[Bold subheading]] -Michael Naranjo- [[Header in bold]] Blind Sculptor Uses Touch, Memory [[Photo caption in bold]] Michael Naranjo, an American Indian who was blinded in the Vietnam war, holds one of the products of his new work: sculpting. At age 29, Naranjo is gaining recognition as one of the West's most promising artists. He works from touch and memory, specializing in dancing Indians, realistic animal figures and characters out of Greek mythology. (AP Wirephoto) [[end bold]] [[Article text]] [[bold]] by LINDA DEUTCH [[end bold]] LOS ANGELES (AP) -- Michael Naranjo, an American Indian, came home from Vietnam with his eyesight gone and his right hand mangled. He immediately took up sculpting. He worked by touch and memory, remembering how his Tewah Indian mother had taught him to mold clay pots in childhood. But his subjects were more intricate -- realistic animal figures, characters out of Greek mythology and dancing Indians whose costumes were painstakingly sculpted feather by feather. "Everyone was surprised at the kind of work I was doing," he recalls. "But it gave me great pleasure, and it was coming out well enough. I could feel it in my hands; it was forming well and starting to take shape." Now, at 29, Naranjo is gaining recognition as one of the West's most promising artists. His work has been shown in one-man exhibitions at galleries in his native New Mexico. The Veterans Administration sponsored a show of his sculpture at the Library of Congress in Washington where he was introduced to President Nixon. Several Southwestern art magazines are featuring photos of his art. The tall, slender veteran, his dark hair tied in long Indian braids, spoke of his work, his blindness, and the war during a visit to Los Angeles. He had [[Large text in middle of article]] Emphasis People [[end large text]] come to deliver a surprise to his mother Rose who had encouraged him to work with clay again. AT his suggestion, she was featured on the daytime TV show "The Girl In My Life" which honors outstanding women. Naranjo was sent to Vietnam in December 1967 after dropping out of Highlands University at Las Vegas. N.M. "School wasn't my thing at the time. I was tired of school." On Jan. 8, 1968, his platoon encountered heavy fighting in the Mekong Delta. A grenade exploded next to Naranjo, blinding him and mangling his arm and hand. "I [[bold]]knew almost immediately that[[end bold]] I couldn't see," he said. "While I was in the hospital, my mother came to visit me. She told me, "There is happiness and pain, and one helps you to appreciate the other," Naranjo recalled. "She helped me to find things, and now I have found my sculpture as a way of life as pottery is hers." In the hospital, Naranjo asked for clay and began his work. He came back to Santa Fe., N.M., moved into his own apartment-studio and began refining his technique. He worked primarily in wax, and by 1970 was confident enough to have several pieces cast in bronze. A Taos, N.M. gallery was the first to exhibit his work, and several of his sculptures now are in Santa Fe galleries. Encouraged, Naranjo has begun work on his first monumental sculpture, a 12-foot bronze. "The hardest part is getting the proportions right," he said, but he asks no help or advice from anyone. "I always work alone. ": He is fond of telling those who ask: "I wouldn't trade my sight for my work. I've come across my profession in a round-about way and the loss of my sight hasn't hindered anything."